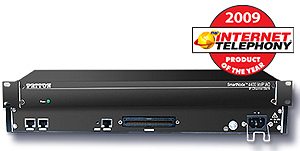 GAITHERSBURG, MD: Patton—the leader in business and carrier-class VoIP, network access, connectivity, and video surveillance equipment—announced today the SmartNode™ 4400 IpChannelBank™ won “2009 Product of the Year” from TMC’s INTERNET TELEPHONY® magazine. Converting up to 32 traditional analog phone or fax calls to Voice-over-IP, Patton’s low-cost IpChannelBank reduces overall CPE cost by eliminating multiple devices on the customer premise. The SN4400 combines VoIP gateway, WAN access, and advanced routing functions with full QoS management and Patton’s unique DownstreamQoS™ in a standalone form factor. Made in the USA at Patton’s Gaithersburg, Maryland facility, SmartNode™ equipment blends high-precision Swiss engineering with high-quality American manufacturing. Prior SmartNode™ awards include 2009 Excellence Award (SmartNode™ 4638), 2008 Product of the Year (SmartNode™ 4961 High Precision Multi-PRI VoIP IAD), 2007 Unified Communications Product of the Year (SmartNode™ 4650), 2007 Product of the Year (SmartNode S-DTA), 2007 Excellence Award (SmartNode™ 4562 Voice-VPN Router), 2006 Product of the Year (SmartNode™ 4960 PRI VoIP IAD), and 2005 Product of the Year (SmartNode™ 4630 BRI Gateway). In addition to such formal awards, SmartNode is amassing community-based credentials. According to a survey on windowspbx.blogspot.com, Windows phone system administrators recently voted SmartNode the “most recommended” SIP PSTN gateway by a substantial margin. Watch for Patton’s soon-to-be-released SN5400 Session Border Controller (SBC), featuring a voice transcoder that converts low-bandwidth ITSP CODECs to high-bandwidth CODECs within the enterprise LAN. Also in the works is a VoIP CPE with an integrated EFM interface that bonds multiple copper pairs into a single high-speed, long-reach broadband access link. Patton is a multi-national organization that designs, develops, and manufactures electronic communications equipment for network access, connectivity, voice-over-IP, triple play and video surveillance. Deployed throughout the world in carrier, enterprise, and industrial networks, most Patton products are manufactured in the USA. Patton is ISO 9001:2008 certified and markets a catalog of over 1000 products including SmartNode™ VoIP solutions (SIP and H.323) for analog and ISDN telephony; Visuality™ mobile-video surveillance, collection, and intelligence distribution solution, ForeFront™ multi-service access infrastructure solutions for TDM and IP service delivery (T1/E1, G.SHDSL, xDSL, dial-up); IPLink™ CPE solutions for last-mile/local-loop access (WAN routers, modems, remote access servers, NTUs, CSU/DSUs); CopperLink™ Ethernet Extenders; EtherBITS™ device servers; EnviroNET™ NEMA4-compliant hardened networking equipment, and a full range of network-connectivity Micro-Products (interface converters, short-range modems, multiplexers, surge protectors). Incorporated in 1984, Patton Electronics marked their 25th anniversary of operation on 1 January 2009. Technology Marketing Corporation (TMC) is a global integrated media company helping our clients build communities in print, in person and online. TMC publishes Customer Interaction Solutions, INTERNET TELEPHONY, Unified Communications, and NGN magazines. TMCnet, TMC's Web site, is the leading source of news and articles for the communications and technology industries. TMCnet is read by two million unique visitors each month on average worldwide, according to Webtrends. TMCnet has ranked within the top 3,500 in Quantcast's Top U.S. sites, placing TMCnet in the nation’s top .03% most visited Web sites. In addition, TMC produces INTERNET TELEPHONY Conference & EXPO (ITEXPO); 4GWE Conference and M2M Evolution (in conjunction with Crossfire Media); Digium|Asterisk World (in conjunction with Digium); and Smart Grid Summit (in conjunction with Intelligent Communication Partners).